The Right Choice for Efficiency, Durability, and Beauty. 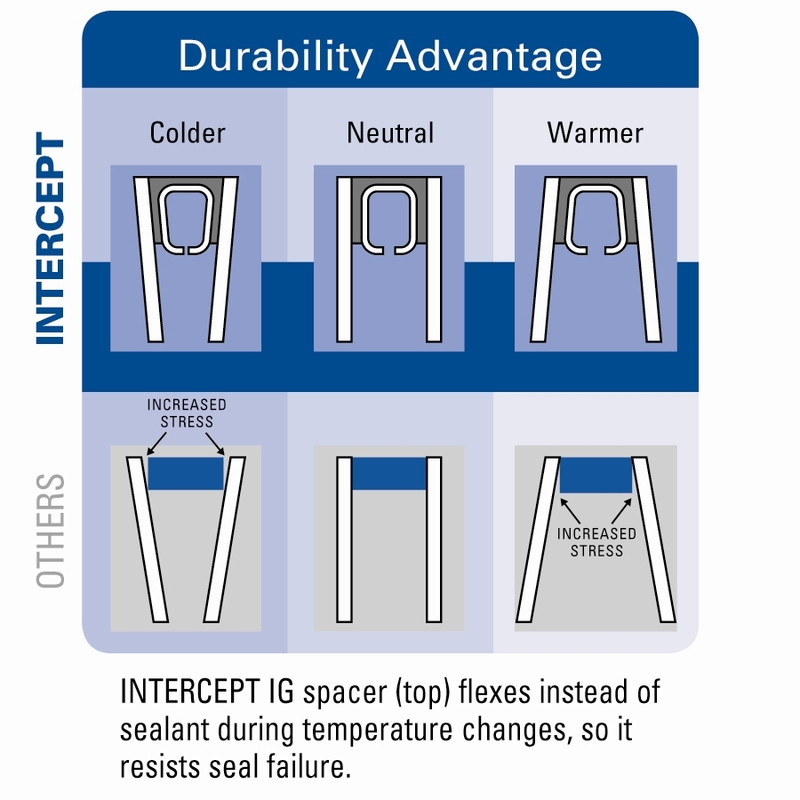 Vitro Architectural Glass (formerly PPG Industries) developed the idea for the Intercept “Warm-Edge” spacer system for insulating glass units (IGUs) when they saw the need for a spacer that had dual-edge thermal capabilities without sacrificing spacer quality. Vitro presented the idea to GED Integrated Solutions, Inc., needing a partner in the fenestration industry with extensive engineering expertise, to bring the concept to life. The first Intercept Spacer Frame Machine (GEN1, now obsolete) was made, and has since had several machine upgrades, with the Intercept 2.5 System being the most technologically advanced spacer frame system on the market. Intercept spacers feature a unique, one-piece, tin-plated or stainless steel, U-channel design that creates an effective thermal barrier to help reduce conducted heat loss through the window. Its sealed, one-piece design makes Intercept spacers stronger and better at retaining insulating gas than many conventional designs. Glenn is a window and glass enthusiast. 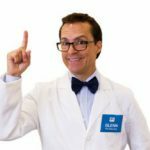 He’s here to help you understand every component that goes into making a window is important. This includes what type of window spacer is used to separate the panes of glass. Stainless Steel vs. Foam: Join Glenn in his lab as he puts the Intercept® Stainless Steel Spacers to the test against foam spacers. Strength and Aesthetics: Glenn tests the strength of Intercept Stainless Steel Spacer versus a typical foam spacer and explains why one looks better than the other when it sits inside a double pane window. Durability and Gas Retention: Glenn illustrates how the Intercept Stainless Steel Spacer’s durability helps it to retain a window’s insulating gas with his microscope and a very common household toy. Thermal Performance: Glenn looks closely at thermal images of windows with Intercept Stainless Steel Spacers versus those with foam spacers and sees something that may surprise you. 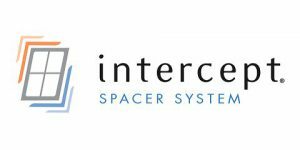 With over 15 billion feet of Intercept Spacer performing every day in more than 900 million windows throughout North America and Europe, and six times fewer call-backs than any other system, it is no wonder Intercept is #1 worldwide. Most durable spacer system: Patented U-shaped design offers superior flexibility with no load on sealant virtually eliminating seal failures. Superior warm edge performance: Meets or exceeds all U.S. Energy Star® and European EN-1279 requirements. 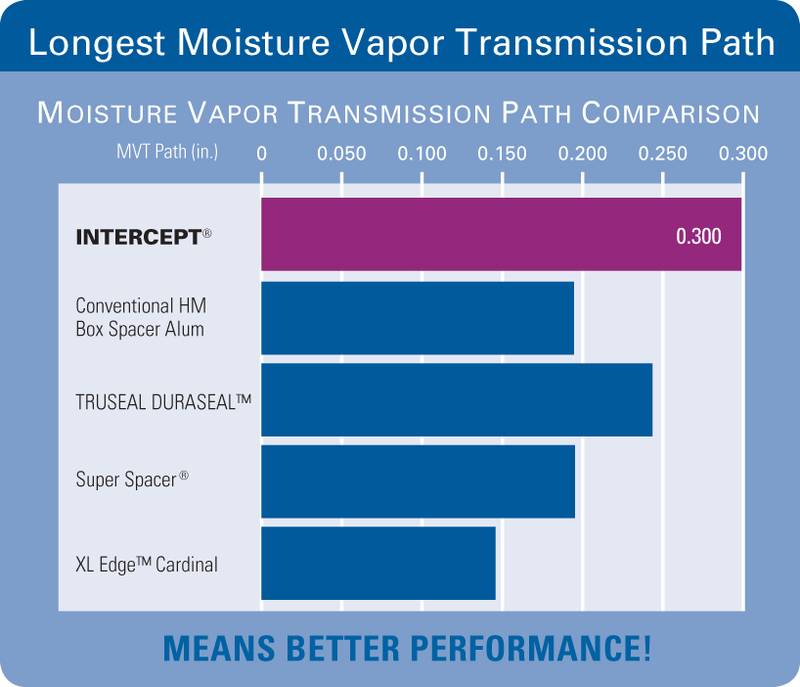 Longest MVT: The longest moisture vapor transmission path of any spacer available providing the most durable seal. Most favorable aesthetics: Marketing studies prove consumers prefer the look of Intercept over other spacer systems at sight line. Strongest corners available: Intercept patented Corner+ 4th corner integrity identical to first 3 corners. 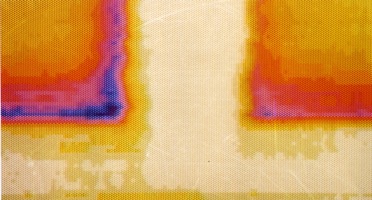 This Thermograph (or “heat picture”) compares room side glass temperatures for an Intercept IGU (right) and a conventional IGU (left). Yellow indicates warmer, blue indicates colder. The Intercept IGU’s glass temperatures are significantly higher, especially near the sash, resulting in higher comfort levels inside a home. Windows that incorporate insulating glass are far more energy efficient than those with single panes. For years, window producers have offered double-paned insulating glass units in their product offer. Traditional spacer material consisted of aluminum box spacer, desiccant, and sealant. Over the years, technological and mechanical advances have offered more efficient insulating glass spacer options, called “warm edge”. A warm edge spacer is made of materials that are less conductive than the typical aluminum box spacer. In addition, spacers with unique profiles can also reduce conduction of energy. These types of spacers reduce condensation and produce higher R-Values. The end result is a window that thermally outperforms other windows, helping to keep buildings warmer in cold weather and cooler in the summer. Intercept Spacer System offers remarkable performance and durability as a warm edge solution. Contact your GED Regional Sales Manager for details on how you can take advantage of this superior warm edge system, all the while keeping an eye on your profits! Intercept is a registered trademark owned by Vitro.